Evently Professional Event Niche Blogger Template. Evently is high quality and professional event niche blogger template for event blogger. This is highly optimized for event blogger. Nowadays event blogging becomes very popular. Previous some days, Onnorokom Vai, gave me a concept for a blogger template. With this concept now MS Design publishing Evently Blogger template. This is highly Adsense ad optimized blogger template and compatible with all kind of mobile and smartphone device. If you're an event blogger or thinking start an event blog, then Evently blogger template will be perfect for your blog. 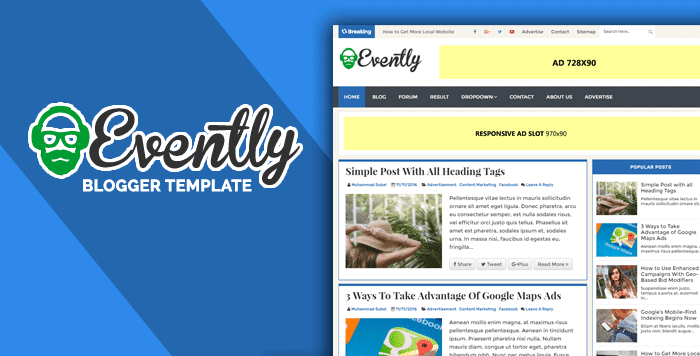 Evently is a fully responsive blogger template and Mobile Friendly. It is also a speedy blogger templates. In this template, we bring some awesome features. A blogger can easily customize with his/her own style. You should check this out below the video. The AMP Free Version Available?